Ocean Jasper Glows Under the Black Light! 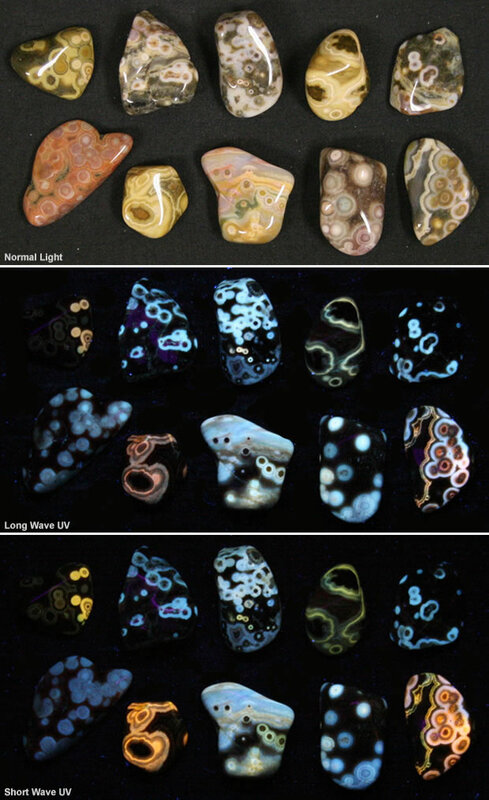 Home » Rock Tumbling Library » Ocean Jasper Glows Under the Black Light! Ten tumble-polished pieces of ocean jasper photographed in (from top to bottom) normal light, long wave UV and short wave UV. We have an ultraviolet lamp that we use for viewing fluorescent minerals. One day we decided to use it to view some tumbled stones. We were really surprised when we viewed Ocean Jasper. Many of the orbs and some of the swirls had a delightful fluorescence - under both short wave and long wave ultraviolet light! Ocean jasper is a trade name given to a silicified rhyolite produced along the northwest coast of Madagascar. Its characteristic appearance is colorful orbicular markings on a green, brown, yellow, cream, red or pink background. The orbicular pattern is produced by small spheres in the material that appear as small circles or eyes on broken, cut or polished surfaces. The orbs usually have many concentric bands that vary slightly or distinctly in color. The wonderful colors and interesting orbs are what make ocean jasper such a popular stone. It makes beautiful tumbled stones and the material is also prized by people who produce cabochons, spheres and other small polished items. Ocean jasper has occasional small voids, which are often lined with drusy quartz. Artistic lapidaries can use these to an advantage rather than hiding them as a defect. Ocean jasper isn't a true "jasper" because much of the material is translucent. With a close examination you will see that the orbs are generally translucent with fine banding. Some of the matrix can be transparent or jelly-like. Fluorescent minerals have the ability to emit light while they are illuminated by light from another source. For the jasper in the photos at right, the top photo was taken with normal light. 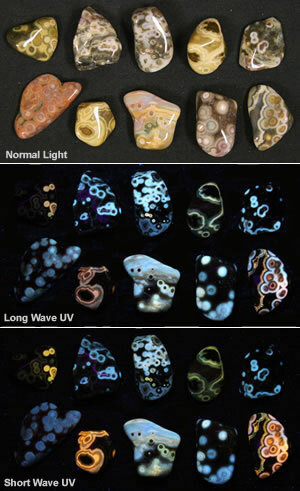 The middle photo was taken with long wave ultraviolet light shining on the jasper. Most materials illuminated with ultraviolet light appear black because ultraviolet light is not within the visible spectrum of the human eye. However, some materials emit light in the human-visible range when they are illuminated with ultraviolet. In the case of ocean jasper, ultraviolet light, which people can not see, causes some of the orbs and banding to emit light with a wavelength that is visible to humans. An interesting article about Ocean Jasper titled: Madagascar's Ocean Jasper - A Lost Treasure Found Again was published on the Yahoo Voices website in July, 2008.